Have had a lovely relaxing weekend away from the hustle and bustle. 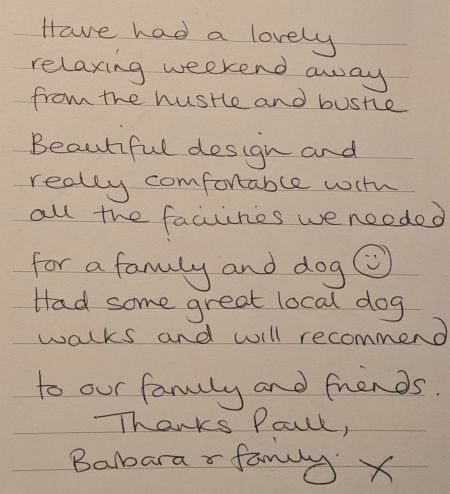 Beautiful design and really comfortable within all the facilities we needed for a family and dog. Had some great local dog walks and will recommend to our family and friends. Thanks Paul, Barbara and family. Had a wonderful stay in your lovel warm cosy cottage that has everything you could want and more even very lovely cake. Thank you will be back some more caches to locate. 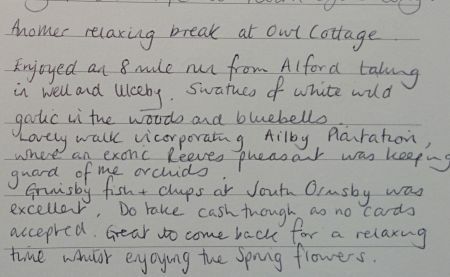 A lovely stay in a very tranquil setting would love to return in the Summer and get out and about more as the heavy snow hindered us this time. Highly recommended. Lovely, tranquil cottage. Awful weather but me managed beach rruns and a visit to Louth - recommends other liked Bijoux in Spilsby. Truly lovely. Would like to come again and stay for longer. Kind welcome from Barbara and Bill. And real peace here after London! HAD A VERY RELAXING WEEK. 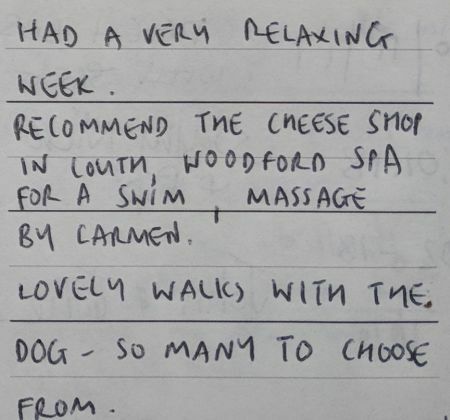 RECOMMEND THE CHEESE SHOP IN LOUTH, WOODHALL SPA FOR A SWIM, MASSAGE BY CARMEN. LOVELY WALKS WITH THE DOG. SO MANY TO CHOOSE FROM. It is so beautiful. Like I am on a farm. Love the trees and everything. (I Just found out I am on a farm) LOVELY and PEACEFUL. Cosy homely cottage with beautiful views. Great location. Very relaxing and peaceful. We had a really relaxing home this beautiful, peaceful cottage. What a lovely part of the country. We also could not have hoped for a warmer welcome! Had a wonderful stay in your lovely warm cosy cottage that has everything you could want a more even very lovely Cake . Thank you wil be back one more caches to locate. Very enjoyable stay great location for visiting the coast and all surrounding areas. Scones and milk much appreciated. Had a lovely, relaxing time here Cottage is superb and in perfect place to explore the district. Super relaxing week escaping from grandparent duties. 4 days of local walks - local guides. Used car twice. Once to Gilbrator point and Skegness. Another day to Louth Hubbards Hill. Visited Gunby Hall on the way here. Haddock and chips at Half Moon Alford was good. Now Lincoln for 2 days. Lovely peaceful stay with walks and dog friendly beaches close by. Now hooked on Lincolnshire. Thank you for the buttered fruit loaf. We had a lovely time in your college. Very peaceful and beautiful scenary. Ours boys and dog enjoyed it too. Thank you. Lovely cottage in a quiet location. A good base to explore the county. Gibraltar Point and Donny Nook good for birdwatching and wildlife. The Blue Bell Inn, Belchford does good food, may need to book. Great week! Lovely cottage very relaxing holiday great area with lots to see and do - Gibraltar point, Sutton on sea and Mablethorpe a must see. Great weak! Many thanks for your hospitality. We have had a lovely family holiday. Owl cottage is so comfortable. What a wonderful hidden gem we loved our long weekend here quiet but also close to Alford its amenities we'll come again! Especially if the homemade scones one available! A very enjoyable stay in this lovely cottage. Easy to visit all the lovely places around and the cottage is well furnished and equipped with everything we needed. We heard the barn oil and saw badgers when out for our evening walk. Barbara and Bill thanks for all helpful information on the local area and for being such good hosts. Best wishes. The plum bread on arrival was delicious! BORN AND RAISED JUST TWO MILES FROM THIS COTTAGE RETURNED WITH MY WIFE AND DAUGHTER TO WATER MY ROOTS! THIS COTTAGE ENJOYS A WONDERFUL POSITION OVERLOOKING THE MARSH AND ON THE EDGE OF THE WOLDS. CLOSE TO THE SEA IT IS PERFECT FOR CYCLING THE QUIET LANES, COUNTRY WALLS AND SAVOURING THE PEACE AND QUIET. 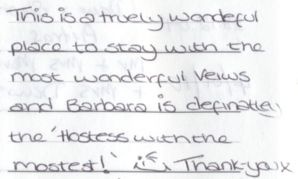 THANK YOU BARBARA AND BILL FOR A COMFORTABLE STAY. Very comfortable and cosy collage. 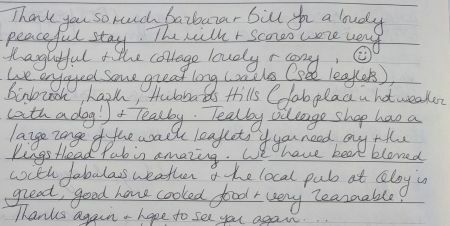 We have enjoyed our stay here, very relaxing was a lovely welcome and the tea bread was much appreciated. A wonderful hideaway for a week, beautiful surroundings, gorgeous views. Barbara and Bill could not do enough for us. The welcoming Cake was lovely. Plenty to do in the area, Rigsby wood was lovely for a picnic. One of our best family holidays yet! We will be back! We have had a lovely stay at Owl Catterge. Beautiful surroundings and ideally located. 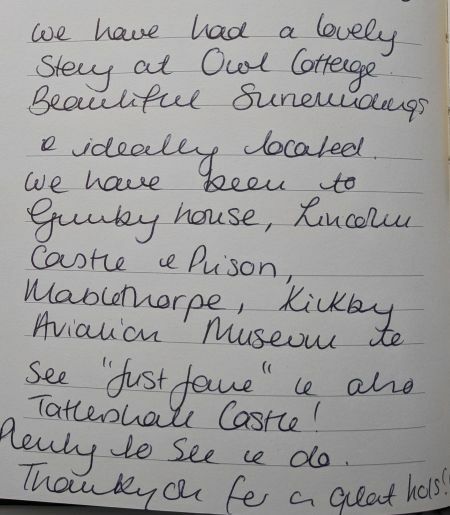 We have been to Gunby House, Lincoln Castle and Prison, Mablethorpe, Kickby Aviation Museum to see Just Jane and also Tattershall Castle! Plenty to see and do. Thank you for our great hols! We have had a lovely stay in Owl cottage and exploring this part of Lincolnshire. We have been to Mablethorpe, skegness, Louth and Lincoln. 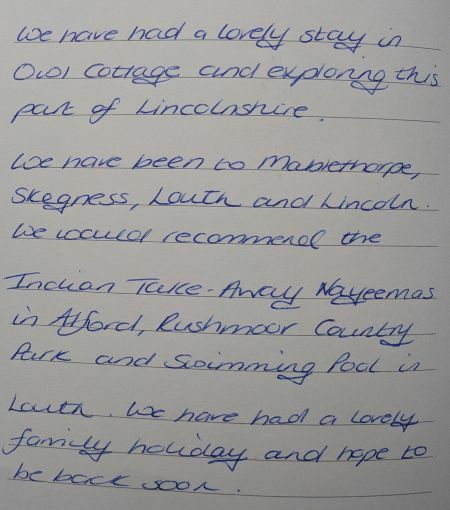 We would recommend the Indian Take Away Nayeemas in Alford, Rushhour Country Park and swimming pool in Louth. We have had a loveby family holiday and hope to be back soon. LOVELY STAY WITH GREAT WEATHER. HUBBARDS HILL IN LOUTH WORTH A VISIT. ENJOYED ANDERBY CREEK NICE MEAL AT RAILWAY ABY. GOOD WALKS FROM COTTAGE. Lovely break for us. Great cottage in beautiful surroundings. Relaxing week, excellent walks. Thank you. A lovely relaxing week. Highlight Danna Nook watching a seal bring born. A lovely cosy cottage, ideal as a base for visiting all our local relatives and friends on our Golden Wedding anniversary. A wonderful holiday in a well equipped little residence. A lovely cottage to celebrate our Silver Wedding Anniversary. The scones were lovely and the milk much appreactiated. Thank you. Hope to see you both again. A lovely well equipped cottage - only wish we did not live so far away! Friendly hosts. Cottage ideal. Lincs is delightful. Very nice peaceful cottage wonderful views. We have had a very relaxing holiday in a beautiful part of the country. A lovely cottage in a lovely setting. Thankyou! J & M, W. Yorks. 4. We had a really relaxing time in this beautiful, peaceful cottage. What a lovely part of the country. We also could not have hoped for a warmer welcome! Perfect setting for exploring. Cottage location and facilities spot on. Recommended: early morning walks in Nature Reserve Woods, Moggs Eye Beach for sand, Lincoln (a definite to do), Gunby Hall (NT). Good meals at Railway Tavern (Aby), Kings Head (Tealby), Kings Head (Theddlethorpe), Black Horse (Donington on Bain). Horse riding at Scambelesby (Brook Houst Farm - a BHS Centre). Plant lovers must visit Cottage Garden Plant Nursey outside Alford. 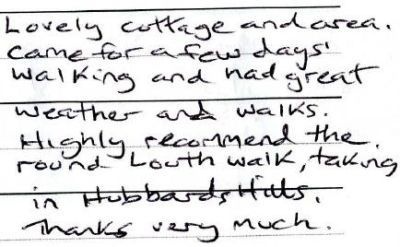 If you go to Louth, take a river stroll at Hubbards Hill. Most of the above dog friendly. Enjoy!! Had a lovely quiet relaxing week. Saw 2 Owls. Recommend Railway Tavern Aby. Great choice of menu. Lovely cosy cottage, with nice cake on arrival. Saw 2x Tawny Owl and a Muntjac deer. An enjoyable week although the weather could have been kinder. 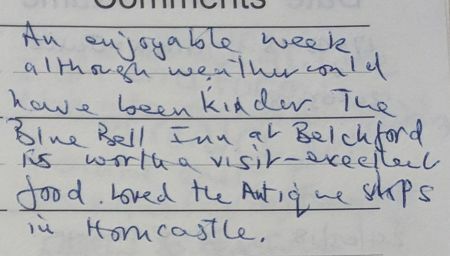 The Blue Bell Inn at Belchford is worth a visit - execllent food. Loved the antique shops in Horncastle. J & C + pet. Bit of a staycation for us - lovely welcoming home from home. G, M & L, Boston. Very comfortable, well equipped cottage. We will come back for another visit. P, P & W. W. Sussez. Lovely stay. Plenty of walking. D & L with Jack. Lincolnshire. Lovely, clean and comfortable cottage. Enjoyed the welcoming scones. Thank you. Hope to come again. 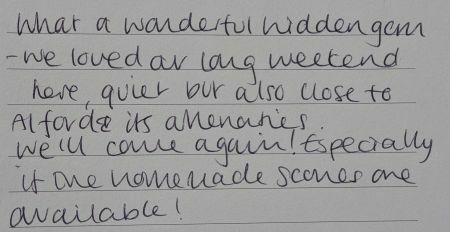 We had a fantastic week at Owl Cottage and packed so much in the time available here. Perfect cottage and beautiful countryside. Many thanks. Had a really lovely stay. It went far too quick. Lovel cosy cottage. Just like home. Hope to come again. Very nice peaceful cottage wonderful views. We have had a very relaxing holiday in a beautiful of the country. A lovely cottage in a lovely setting. Thank you! J &s; M, W. Yorks. We have had a wonderful holiday in lovely Owl Cottage. 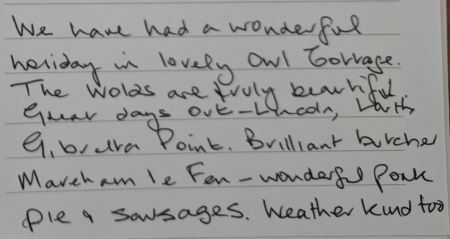 The Wols are truly beautiful great days out - Lincoln, Louth, Gibralater Point. Brilliant butcher Mareham le Fen - wondeful pork pie and sausages. Weather kind too. 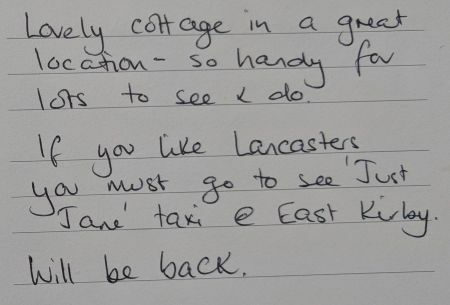 Didn’t know what to expect of a Lincolnshire stay - but found it friendly, delightful. Comfy cottage with cake on arrival. Beautiful area. Thanks to all the Read family! 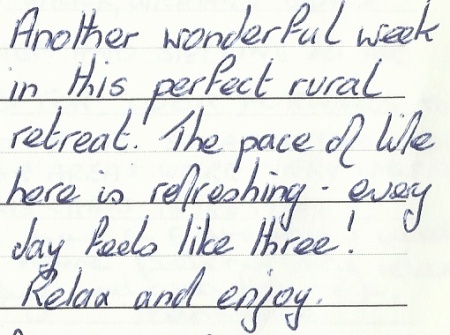 Clean, warm and very comfortable cottage and excellent walks from the door and idyllic setting and lovely peaceful church equals a super Easter break for us! Thank you for a lovely holiday Barbara and Bill. Loved the cakes and scones! Beautiful countryside, church, wood, birdsong, spring flowers, cottage ok! Very much hope to return before long. Another relaxing break at Owl Cottage. Enjoyed an 8 mile run from Alford taking in Well and Ulceby, Swathes of white wild garlic in the woods and bluebells. Lovely walk incorparating Ailby Plantation, where an exotic Reeves pheasant was keeping guard of the orchids. Grimsby fish and chips at South Ormsby was excellent. Do take cash though as no cards accepted. Great to come back for a relaxing time whilst enjoying the Spring flowers. We&ve had a lovely break, such tranquil surroundings and comfortable cottage. Visited Lincoln - a beautiful city. Walked the Castle Walls! Many walks in the Wolds a couple of trips to the beach. Fantastically relaxing. 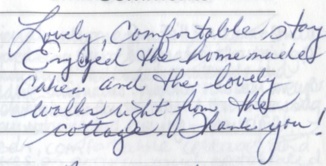 A very warm welcome to a very comfortable cottage. Ideally situated for walking and visiting many interesting places. 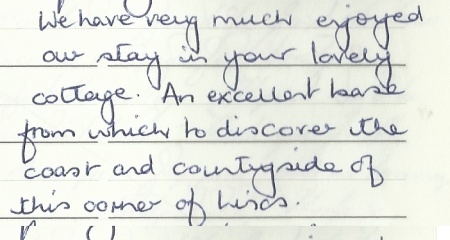 We have thoroughly enjoyed our stay in Owl Cottage. The kitchen is the best equipped of any cottage we have stayed! We have taken advanatage of the fabulous walks and cycling, and also the promimity of the coast with trsips to Gibraltar point and Sutoon-on-Sea. Thanks Barbara and Bill for a fantastic cottage and yummy cake on our arrival. Lovely cottage. Nice place to stay as we visited Lincolnshire family. Really Lovely Cottage and very peaceful. Many thanks Barbara and Bill. Hope to come again. Great stay - really lucky with weather. Fantastic house and location great walks - shmae some of the pubs now closed. Nayeema's Indian in Alford looks odd but food is great. Thanks for a great week. Many thanks Barbara, Bill (and Pluto!) for a wonderful relaxing weekend - cycling, walking and enjoying the beautiful cottage. Here visiting medieval churches, inspired by the late Sir Simon Marsen. Weather was not great for photography, but Barbara’s hospitality and lovely cotttage made our stay very relaxing and enjoyable. Love Lincolnshire, the people and will return. Cottage is excellent. Thankyou. We have had a lovely short break. The weather has been mostly fine. We have had some good walks at the coast since the local fields looked rather muddy. Can recommend Gilbraltar Point, Saltfleet and Donna Nook. The latter great if you like fast jets practising attacks! 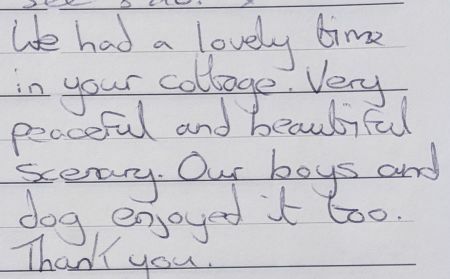 We have had a lovely holiday staying at Owl Cottage. 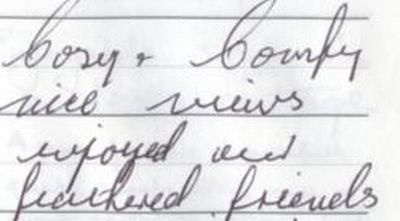 Barbara & Bill are so welcoming. 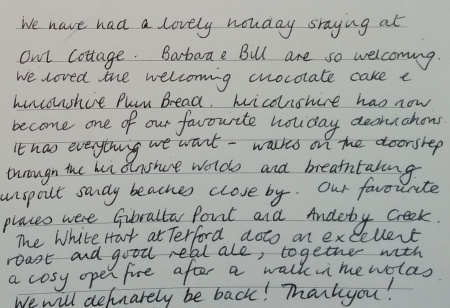 We loved the welcoming chocolate cake and Lincolnshire Plum Bread. Lincolnshire has now become one of our favourite holiday destinations. 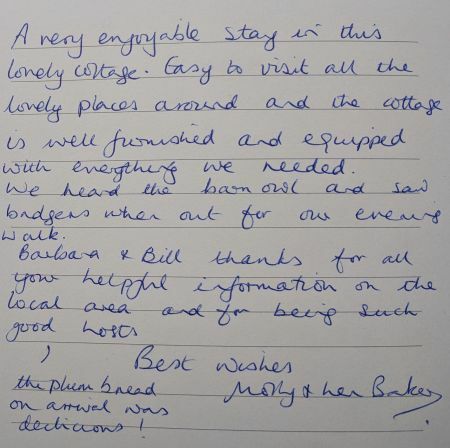 It has everything we want - walks on the doorstep through the Linolnshire Wolds and breathtaking unspoilt beaches close by. 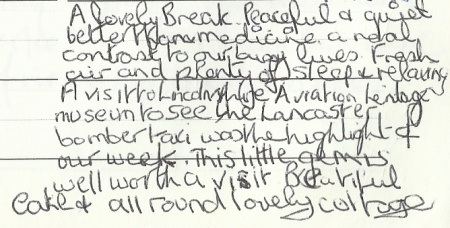 Our favourite places were Gilbralter Point and Anderby Creek. The White Hart at Telford does an excellent roast and good real ale, together with a cosy open fire after a walk in the Wolds. We will definitely be back! Thank you! 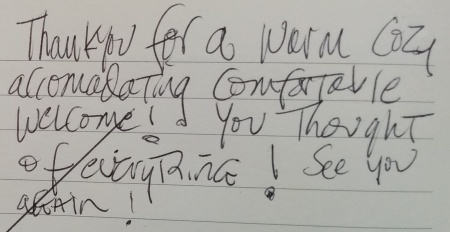 Thank you for a warm cozy accomadating comfortable welcome! You thought of everything! See you again! 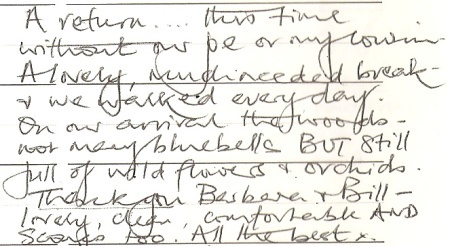 We have had a wonderful holiday - thankyou to Bill & Barbara for making our stay so pleasant. Really friendly couple. Also had really good weather. Lovely comfortable cottage what more can we say. Batteries recharged, job done and all ... Best Holiday Cottage in the World!!! A beautiful cottage, wonderfully situated to explore the Wolds. Charming owners, very hospitable with cakes and a warm welcome on arrival. We'd love to come again. Thank you! We found the cottage comfortable and very clean - lovely kitchen and bathroom! Well placed for walking/visits inland (Adults enjoyed Coningsby) and for beaches (kids loved seaside!) 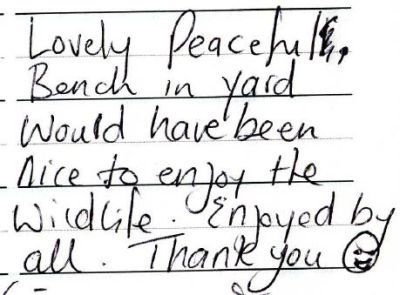 Spacious grounds and good hosts. Lovely cottage, really nicely done. Very comfortable. Enjoyed the views. Had a really nice time exploring this corner of Lincolnshire. Great hosts. Thank you very much! 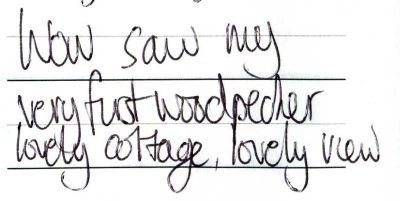 We had a wonderful stay in the cottage. Everything you need to have a great holiday. The kids loved the neighbours - cows and the seaside. The surrounding town and countryside where lovely to explore. Thank you Barbara lovely host. 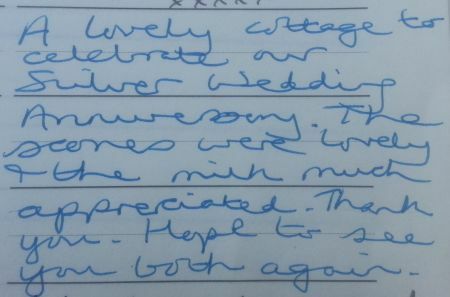 We are so pleased to have found this lovely cottage - everything was just perfect and the weather was kind to us too. Did plenty of walking and cycling. Will definitely be back. Many thanks Bill & Barbara. Cosy cottage - memorable visit to my mothers childhood home, good explores of Wolds. Thank you Barbara for our relaxing few days. Simmel cake was delicious! It was good to see where my family lived, but more than that a very enjoyable stay in a great cottage. 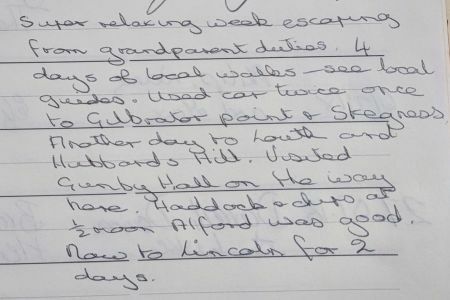 We walked to Alford, climbed the tower at Louth and had a very good dinner at the Anchor Inn in Alford. We joined in the quiz and bingo! Wonderful cottage - everything you need catered for. Secure cycle store - great. Great cycle rides and walks. Barbara & Bill great owners and friendly. Very peaceful and quiet. Don’t want to leave. Thanks - PS Lovely cakes on arrival, sorry we missed saying goodbye. Lovely week. Weather super. Walked, cycled and enjoyed the nature. Had a very enjoyable week - we will be back: still lots to see! The family had a great time in the cottage plus weather was great. Bye! Very comfortable cottage with everything we needed. Good base for seeing Lincolnshire, coast, countryside. Lovely cottage,lovely stay. Weather Super. Enjoyed exploring the countryside coasts and Lincolnshire. Thank you very much. Fabulous time. Loved it! Great cakes - yum!!! So peaceful yet there is plenty to do nearby. 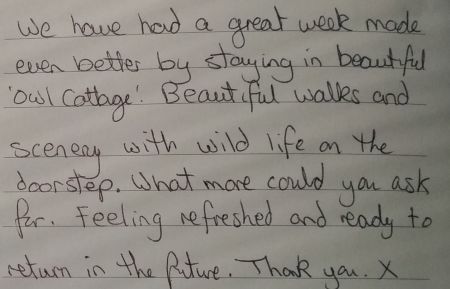 Fantastic walks, comfy cottage would love to try a winter break. Loved the views from the back bedroom. Will miss the walks on the beach. Most enjoyable. The dogs loved it too! Very pleasant and comfortable and warm, especially welcome on our snowy arrival! Excellent place and worth returning to when next visiting Gunby. Another lovely stay, look forward to coming back. A very lovely cottage terrific walks and this is the life. Thank you. A return.... this time without our Joe or my cousin. A lovely much needed break and we walked every day. On our arrival the woods not many bluebells but still full of wild flowers and orchids. Thank you Barbara and Bill lovely, clean, comfortable and scones too! All the best x. Really enjoyed our week so peaceful and relaxing. A lovely cottage. Another lovely stay at Rigsby Cottage. Thank you! Nice cottage. Enjoyed our stay. Lovely cottage in beautiful location, ideal accommodation, a super holiday all round! Thank you. Very much enjoyed our introduction to the Wolds very peaceful. 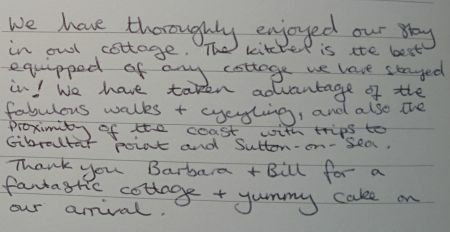 Thanks Barbara and Bill we had a lovely time again our 3rd visit. Weather again very good. 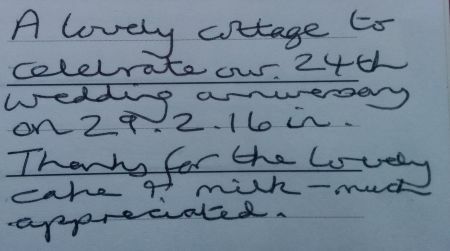 Thank you, lovely cottage very peaceful and loved the cows visiting us. We've had a lovely week. Our second family visit to the area, so we found plenty of place to visit. Beautiful spot! Thanks to Bill who helped us make the best of our week's holiday. 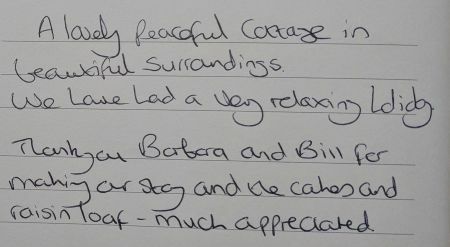 We have had a lovely week in the cottage, some lovely long walks, Bill and Barbara both lovely and we will recommend it to friends and family, its a lovely peaceful place to go for a week away. A comfortable stay with mixed weather but plenty to do locally and some new areas explored. 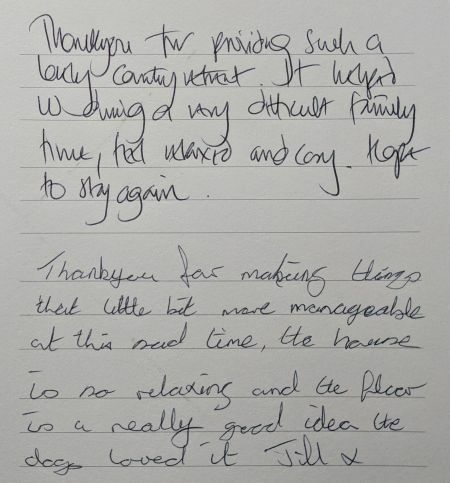 Enjoyed our relaxing stay in your delightful cottage and hope it wont be too long before we return again. Well rested from our busy lives. Welcoming hosts Barbara and Bill. Delicious carrot cake on arrival thank you. Enjoyed abundant wildlife. Gibralter, Louth and Tattershall Castle worth visiting. Neighbour Stuart very pleasant and good source of local information. We said we'd come back and we have another lovely long weekend in this comfortable cottage, mostly good weather and some pleasant walks! Loved our stay here will most definitely be back! Such peace and quiet! Chickens for company each evening! Good golf and cycling despite some very iffy weather. Enjoyed our first ever visit to Lincs. Another wonderful week in this perfect rural retreat. The pace of life here is refreshing - every day feels like 3! Relax and enjoy. Another lovely relaxing holiday at Rigsby! Pity the weather wasn't fine. A lovely break. Peaceful and quiet better than medicine a real contrast to our busy lives. Fresh air and plenty of sleep and relaxing. A visit to Lincolnshire Aviation Heritage Museum to see the Lancaster Bomber taxi was the highlight of our week. This little gem is well worth a visit. Beautiful cake and all round lovely cottage. Much better weather than in the spring hot and sunny. Brown hares and deer seen on the local walks in evenings. Peaceful and quiet. Just as we had hoped, perfect. 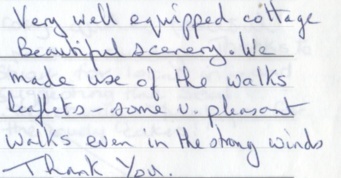 Thank you we enjoyed the cottage and its little garden very much as well as the friendly owners and neighbour. The drizzle cake on arrival was very welcome! Hope the harvest goes well. 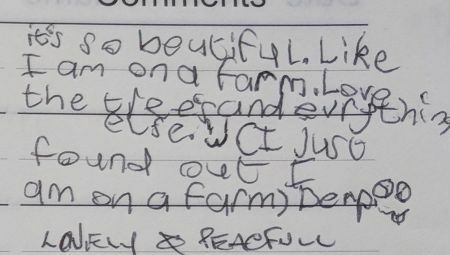 What I particularly relished was the friendliness of this little parish and the way Mrs Read provides what we think we would like ourselves thank you. Great cottage. Great weather. Great walks (apart from some ploughed over footpaths). Loved our chats with Stuart next door. Thanks for everything, Barbara the scones were very welcome after a long drive. Those who have been before us have said it all. To those that come after us enjoy. Nothing is 24 hour opening and so peace perfect peace. Thank you to Bill and Barbara for letting us borrow the cottage and for the welcome. Sincerely appreciated. A very comfortable base from which to explore the surrounding countryside. Many thanks. Once again a wonderfully relaxing few days spent in your beautiful cottage in such relaxing surroundings. Always find somewhere new to explore. Another great stay. The Lincoln Christmas Market was very good. Despite the cold weather. Had a great time, great weather, lots to see and do. Lovely cottage and we would certainly come again. 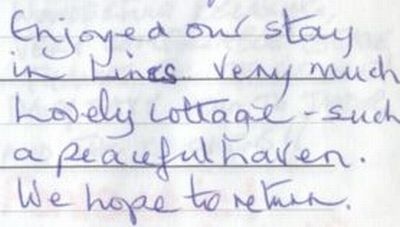 We found the cottage very homely and felt very relaxed here. Good weather, comfortable cottage, interesting town, village and lovely countryside. Had a good time, excellent beers and food at Station Aby and good value. We had such a nice time. The cottage itself, the surrounding, the peace and quiet all combined to make it a lovely week. We hope to come again in the future. Had a great time in your wonderful cottage. We will have to come back for longer next time! Perfect location for us, perfect country retreat. Will use again. Very well equipped cottage in beautiful tranquil location. 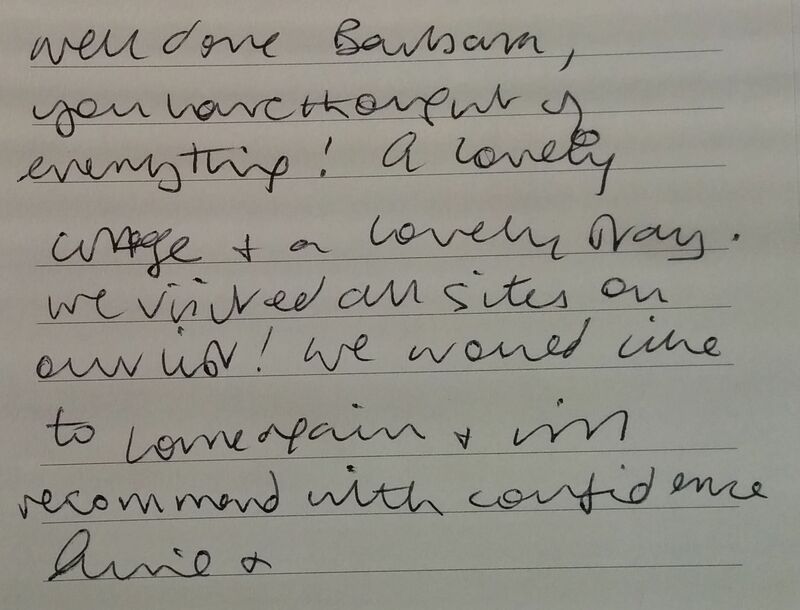 Thank you Barbara and Bill for going the extra mile - particularly regarding the wasp incident! Had a lovely time here, the cottage was great and the area is lovely. Will recommend the cottage. Thank you Barbara and Bill. Had a lovely time. Great little cottage! Delightful cottage - the perfect place to spend Christmas! Beautiful cottage, adorable location, a home from home. Lovely stay and New Years break. Once again loved it, do not want to go home! Peaceful, quiet and very relaxing. Thank you for a lovely few days. Peaceful cottage. Great base for house hunting. Beautiful Lincolnshire. 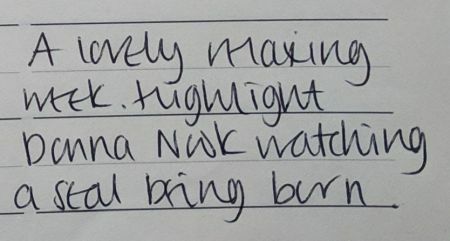 Weve really enjoyed our stay. Walking; seeing the bluebells and orchid!! Alford, Gunby Hall, beautiful cottage and view. Thank you Barbara and Bill. Also enjoy talking to our neighbour - all in 4 days!!! Very pleasant cottage - lovely dog! Good birdwatching, esp. swallows. Peaceful and quiet. 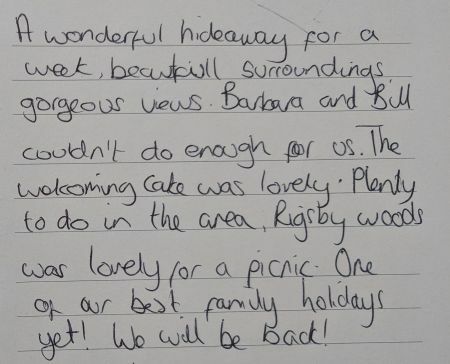 Rigsby cottage is a perfect for a holiday, quiet, peaceful and tranquil, what more could anyone want, comes very highly recommended. Great weather, perfect cycling. A totally relaxing break! Once again enjoyed our stay with you, and hope to return soon. Lovely, comfortable stay. 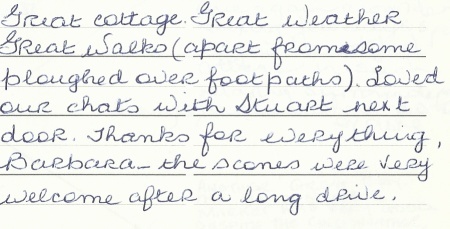 Enjoyed the home-made cakes and the lovely walks right from the cottage. Thank you! 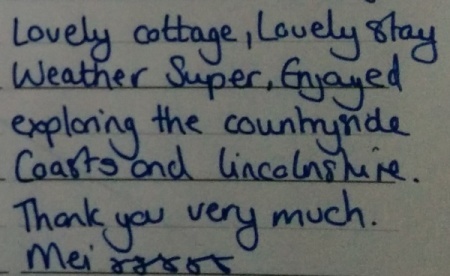 A great welcome, a great cottage and a great week in Lincolnshire. Thank you. Very well equipped cottage. Beautiful scenery. We made use of the walks leaflets - some very pleasant walks even in the strong winds. Thank you. Great relaxing stay in lovely countryside. Everyone friendly, cottage a great base. Would recommend Louth swimming pool,Lincoln castle and Skegness beach. Thanks. We hope to return. Cottage couldn't be more comfortable - like a home from home - thank you. 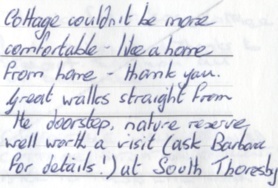 Great walks straight from the door step, nature reserve well worth a visit (ask Barbara for details!) at South Thoresby. 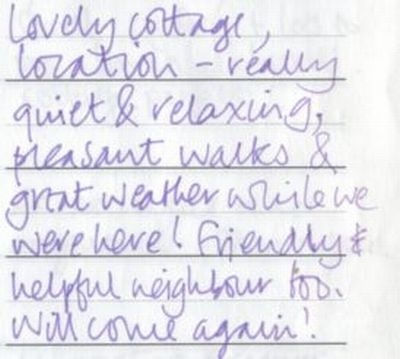 Comfortable, well appointed cottage, situation excellent! Back to town life after today. Thanks for everything. We had a wonderful holiday. Cottage is a great base for walking and touring the area. If you get a chance visit Hubbards Hills (Louth) - really beautiful. A lovely homely cottage. 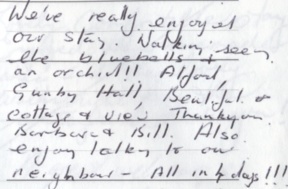 We all loved staying here and would love to return. The cottage wins us over with its rustic charms and its idealic setting. A lovely peaceful cottage and what a beautiful part of the country - perfect! Lovely cottage wonderful break - the kids loved it! We came back! Lovely and cosy. Lovely cottage and area, came for a few days and had great weather and walks. Highly recommend the round Louth walk, taking in Hubbard Hills. Thanks very much. Very comfortable cottage, in lovely situation, enjoyed walking and the wildlife and the friendly cows, loved the peaceful church. Lovely cottage location - really quiet and relaxing pleasant walks and great weather while we were here! Friendly and helpful neighbour too. Will come again. Enjoyed our stay in Lincs very much. Lovely cottage such a peaceful haven. 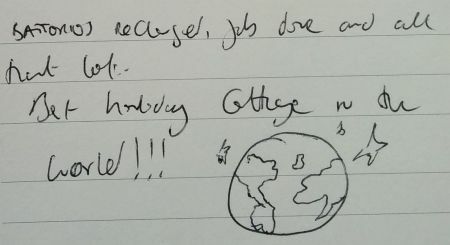 We hope to return. Cosy and comfy will views enjoyed and feathered friends. So peaceful and comfortable - thank you. Wonderfully relaxing, very comfortable cottage. Thanks for the welcome! Daisy says hello to Jasper and the chickens!! Fantastic! Eleanor says Hi to the chickens. Enjoyable stay in a lovely cottage. Lovely cottage, lovely location - great holiday. A perfect cottage with a wonderful neighbour. Warm & welcoming cottage, people and locality. Many thanks Barbara and Bill. Great autumn week with lots to do, lovely cottage. Less than an hours drive from home but a world away in terms of peace and quiet! Ideal for relaxing and recharging heavily depleted batteries. (Home-made cake also helped!) Thank you. Just what we needed. Quiet and relaxing with lovely views. Thank you. 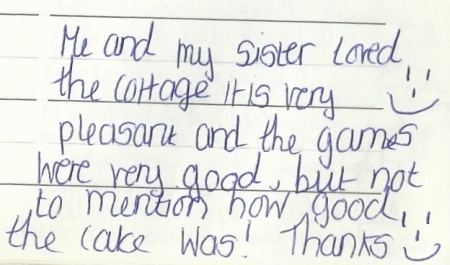 One of our best breaks, we would recommend this cottage to anyone. Lovely cottage, we did not need to bring general house stuff and got some much needed sleep. We hope to return, I did not even know such a place existed so close to home.